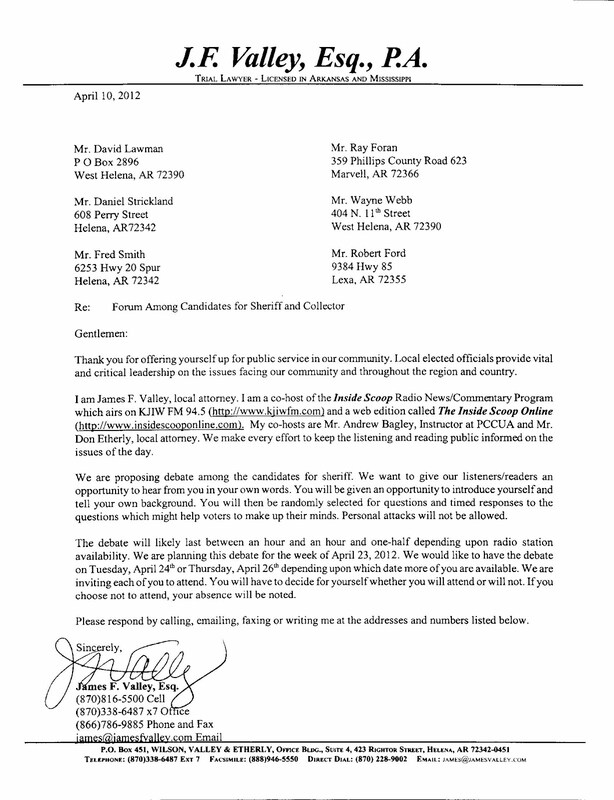 HELENA-WEST HELENA -- Last week, on behalf of The Inside Scoop and The InsideScoopOnline.Com I submitted a letter to the six candidates vying for the democratic nomination for Sheriff of Phillips County, Arkansas. Our long tenured sheriff, Mr. Ronnie White announced late last year that he did not intend to seek re-election. The six candidates who have filed for office as Democrats are in alphabetical order: Ray Foran, Robert Ford, David Lawman, Fred Smith, Daniel Strickland and Wayne Webb. We are asking you to participate in the debate by emailing questions you feel are appropriate to debate@insidescooponline.com. You can also mention @scooponline on twitter with any questions you suggest. We have confirmed attendance of Ray Foran, Robert Ford, David Lawman, Fred Smith and Wayne Webb. The debate is tentatively set for Tuesday, April 24th at 5:00 p.m. It should also air on KJIW FM 94.5 Radio beginning at 8:00 p.m. We have some lose ends yet to tie. Standard debate rules will apply. The purpose of the debate is not to hurt or help any candidate but to instead allow the voters to get to know the candidates better and make an informed decision about the future head of law enforcement and tax collection in Phillips County, Arkansas. The primary election is May 22, 2012. 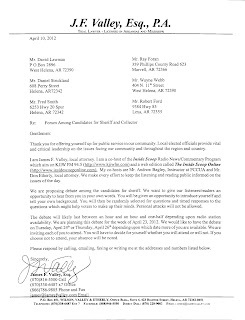 Early voting begins on May 7, 2012. The last day to register to vote is April 23, 2012.